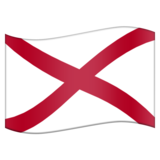 This is how the 🏴󠁵󠁳󠁡󠁬󠁿 Flag for Alabama (US-AL) emoji appears on Emojipedia 11.1. It may appear differently on other platforms. 11.1 was released on Feb. 19, 2018.